The enchanting atmosphere of this delightful B&B serves as the perfect haven for the weary traveler with its flourishing green gardens, delicious food, impeccably decorated bedrooms and warm welcome by Candida, the owner of this country B&B. The 17th century farmhouse has been lovingly restored and perfectly captures the flavor of Tuscany highlighting not only the tranquil family life of the owner but eminating a friendly air which induces you to settle down and relax. There are 3 double bedrooms available at this charming bed and breakfast each with its own personality and private bath. “Neri” is located on the ground floor with tints of green featuring a handsome stone arch and unique artwork. Up the stairs, on the first floor, are the remaining two bedrooms boasting a wonderful view over the well-tended garden and vineyard covered surrounding hills. There is the "Martina" room in shades of pale yellow and blue with a romantic four poster bed. Then there is the "Mattia" room with open wood beam ceiling and authentic terracotta floor, with a full bath with a tub. The lovely calm environment reflects her past and her passions. Candida loves to keep busy and you get to enjoy the fruit of her labors in the form of a carefully cared for garden, homegrown garden fresh vegetables, herbs and more in her homemade meals and delicious breakfasts. Her passion for gardens and garden decor was her past vocation and you get to see her collection it is most natural "showroom": the garden furniture and art you see throughout is all for sale. Find anything you like? Make sure to ask for the price! Inside, the many hats and milliner forms you see are the remains from the family business in Florence. She joined her father, Francesco Bing, in the family business which produced women’s hats for department stores and shops in Europe, America, Australia, and Japan. We highly recommend you reserve one of her homemade dinners featuring local dishes for a complete Italian style meal. Cost is 35 euro per person which includes an antipasto, pasta, main course... and, of course, dessert. Wines are NOT included, but there is a wine list and those are paid separately to give every guest the possibility to enjoy what they choose. For those looking to pick up a few pointers in the kitchen to show off at home, it is possible to participate in a cooking class with Candida (70 euro per person including dinner, minimum 2 people to book). Candida makes the most of the fresh veggies, fruit and olive oil from her own garden and features them at both breakfast and dinner. Scattered throughout the house in the dining room and garden are lovely collectables which enhance that relaxing, lived in feel one expects from a B&B in Tuscany. Browse through her fun collection of milliner forms or enjoy the more than 300 varieties of roses, not to mention herbs and flowers, in her private oasis as you walk around and discover pieces of garden decor all throughout the various areas of the gardens. 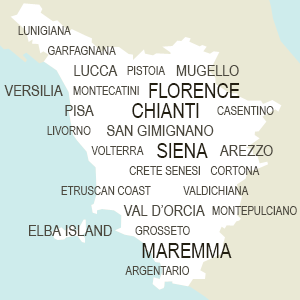 San Casciano is the closest little town to the B&B accommodations, only 3 km away. Though a car is advised for getting around Tuscany, it is possible to enjoy the local scenery by foot and stroll into town for some afternoon gelato. There are several charming towns within 30 minutes of Candida's Chianti House which offer a medieval architecture, wine tasting and delicious restaurants. It is easy to plan trips to nearby Greve in Chianti which offers markets on the weekends, Montespertoli - the center once owned by the Machiavelli family - or take the cable car to Certaldo Alto of Etruscan and Roman origin. The ideal position of Candida's Chianti House makes visiting the various corners of Tuscany easy. The incredible art and culture mecca of Florence with its museums, galleries and shops make it a must for anyone visiting Tuscany. Towards the south is the UNESCO World Heitage Site of Siena and the nearby jewel of Montereggioni with its 14 towers protecting the main piazza and Romanesque church. Towards the coast, not far from San Casciano is the Etruscan strong hold of Volterra, well known for its creations in alabaster as well as a popular scene for many fictions. I have lived in this house for over 30 years. It is where I have built my garden by planting every single bulb, every bush and every tree. It is also where I watched my children grow, where I painted and where I collected and sold antique pieces of garden furniture. Now that I am on my own, I love to receive guests and cook for them using my home grown olive oil, vegetables from my private patch and fruit from my garden which I enjoy making into marmalade and limoncello. I think of my home as a very peaceful place; it is close to several artistic points of interest and surrounded by vineyards with a splendid panorama. I opened up my home to share my oasis with my guests - I look forward to welcoming you to my home soon.